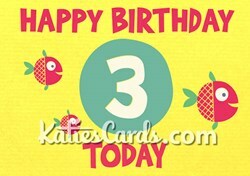 Katie’s Cards, a leading UK ecard company, have added a range of age-specific birthday cards to their extensive catalogue of over 250 designs. Children love getting cards that proudly announce their age and if it features a fun animation that they can enjoy over and over again, it can make for an even more memorable birthday greeting. Katie’s Cards, a designer of quirky and entertaining ecards based in Teddington, has launched a line of age-specific birthday greetings to celebrate with children aged 1-10. The new designs, which were announced at the end of October, are now available for members of the ecard company to preview and send. Followers of the Katie’s Cards blog have been able to track the development of the design process with regular updates and sneak previews of the ecards, which have been created with the relevant age-groups in mind. The blog shows initial sketches and completed artwork previews for the various ages. The third in the range of age-specific ecards uses simple shapes and block-colours for the greeting, along with a catchy soundtrack. The ‘3rd Birthday Fish’ ecard features a school of brightly coloured fish as they swim into frame, letting out air bubbles as they go. One of the bubbles contains the number three, which grows in size to create part of the ‘Happy Birthday’ message. Users can also add their own personal message to the ecards. Insistent on their approach to offering varied choice for a range of celebrations to its members, over ten new ecards have been added to the site since the beginning of 2014, including several new additions to the Chinese New Year Category ready for the celebrations on Friday, 31st January.